1998 L. Aubry Fils Champagne Le Nombre d’Or Campanae Veteres Vites Brut: Retail $85. If you do not like old Champagne this is not for you. So if you have a bottle of this, I will gallantly take it off your hands. A bit golden with some faint bubbles, but oh that nose. Whoa. I seem to be saying this a lot lately: this is why I love old champagne. I guess old Champers is more of an acquired taste–I have shared old champagne with a number of friends who have not been all that enthralled, so I am hesitant to break a bottle out with someone who is not clearly a fan. I understand why someone would not like it (they’re freaking bonkers), but at the same time I do not want to “waste” one of the great pleasures in life on a total whack job. Outstanding. 93-95 Points. 2014 Château d’Esclans Whispering Angel: Retail $20. Make no mistake, this is a fabulous rosé and at around $20 it is a bargain, but this bottle was ever so slightly lacking in fruit. Yes, it was crisp, yes there was a great finish, but without that tiny burst of red berry fruit upfront, I feel a bit cheated. I normally contend that a good rosé can last well past the season of its release (I have some 2012 Chinons that are still gangbusters and a 2009 Tavel that is ridiculous). This one? Not so sure… still, Very Good. 88-90 Points. 2005 Helfrich Gewurztraminer Steinklotz: Retail $25. Classic Alsatian Gewurztraminer through and through. Lychee and pineapple with a touch of sweetness, the acidity kicks in halfway and persists through the memorable and lengthy finish. This is precisely what I look for in a Gewurz: the wine is very floral and can be a bit too sharp without the right amount of sugar left in. It can also be cloying and flabby with too much sweetness. This? Like Goldilocks: just right. Outstanding. 91-93 Points. 2003 Hubert Lamy Saint-Aubin 1er Cru en Remilly: Retail $55. I poured and the golden color scared me. A lot. I have had a bad run of pre-mox white Burgs and I thought “here we go again…” There was some oxidation here, but it was slight. Unfortunately so was the fruit. Very Good still, but not a lot more, sadly, which means I need to drink the other two bottles soon. Anyone want to help? In the name of science, of course. Good to Very Good. 86-88 Points. Now? Still want to hate it. Still can’t. Still have four bottles, which makes me still happy. Just don’t tell anyone I really like it…. Very Good to Outstanding. 89-91 Points. 2005 Mommessin Fleurie Les Roches: Retail $22. A bit animal up front with some red berry fruit behind. In fact this is down right bohemian on the nose: big and meaty. On the palate this is really intriguing. Fruit and flesh. As the bottle wore on this seemed to become richer, with the fruit coming forward and the meatiness receding a bit. A solid Beaujolais Cru, but unlike any Fleurie I have had, as they are normally, well, more floral. Very Good to Outstanding. 89-91 Points. WINE of the WEEK: I could sit here and pretend that a couple of the other wines this week were in contention for WotW but we all know that would be a lie. The 2005 Helfrich Gewürztraminer Steinklotz was a treat and exactly what I always hope Gewurztraminer will be, but this was the sixth bottle I have had of this wine and the others have been less than exquisite. Then there was the 2014 Château Miraval Côtes de Provence Rosé, but let’s get real here–the winery is owned by Brad Pitt and Angelina Jolie, and while I am sure they are the epitome of a loving couple and great parents, the last thing I want to give them is any more press (since no doubt they and all their fans are regular readers of my weekly round-up). No, there was never any doubt what the Wine of the Week would be from the moment that I went down into the cellar to fetch it. 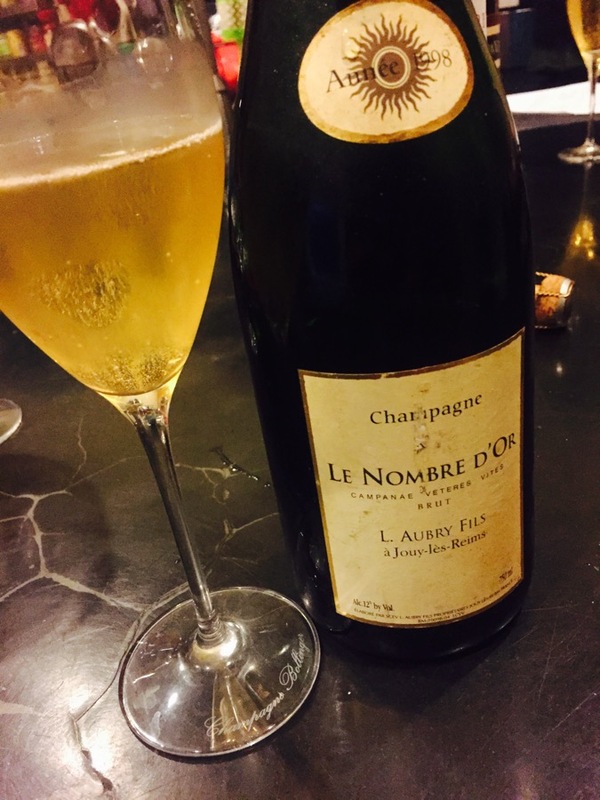 Another wine writer (Joe Roberts, aka 1WineDude) was over and he knows I am a bit of a Champagne hound–so I had to bring out something at least a bit memorable so I opted for the 1998 L. Aubry Fils Champagne Le Nombre d’Or Campanae Veteres Vites Brut. The memory of this wine might linger for a while as even though the sparkle was straining to remain a player, the wine was a champion. Hopefully, Joe has similar memories. That did not stop him for a heartbeat, however, to remind me on countless occasions that he was in Champagne last week on a press trip…and I wasn’t. As a result? Next time he gets André, “American Champagne”. That should be memorable, no? This entry was posted in Barbera, Burgundy, Cabernet Sauvignon, Chardonnay and tagged Wine of the Week. Bookmark the permalink. I had a Vinho Verde yesterday that I failed to get the name of, but thoroughly enjoyed (enough so that I didn’t bother to figure out what it was, apparently). Also, should you find people who are willing to part with alcohol, I will happily drink whatever they give you which you don’t want. Loooove the Vinho Verde (we served it at our wedding)! I will put you at the top of the list of the unwanted booze volunteers! Yes! I like being at the top of that list. And I am thinking of taking a trip over to the local wine shop to see if I can get some more Vinho Verde. It was excellent, and I am sure I could use a bottle (or two. Or three – why limit myself?) for the weekend. We share taste in Champagne (tried lots of lovely stuff last week including 1998 Lanson Gold Label which was lovely) and Alsatian Gewurz, bravo! ’98 was a bit of an under appreciated year, in my book! You are on the list for white Burg purging! Shame about that particular Lamy and that I am not closer as I would certainly volunteer my services to decrease the number of bottles of this in your cellar! 🙂 I have had a couple of wines from him and have always enjoyed them – have you tried his wines before? I have had several of Lamy’s bottlings from Saint Aubin and we have always been thrilled. Sure, this bottle was a dozen years old, but 1er Cru Burgs should be able to handle that with no problem…. I’ve never had an old Champagne. Now I’m curious! I also had the Whispering Angel Rose this week. Loved it. Now I want to try the other Rose you mentioned. Never had old champagne? That, my dear, is a travesty that you should correct post haste. As for the Château Miraval, it is lovely, but a bit pricey ($25)…. I think I will have to fix that situation! Any recommendations on where to start? “Old” is hard to find. I would buy some vintage champagne and hold onto it for a while. Otherwise, I could bring some to #WBC16 next year!